For naturally lengthened and volumised lashes, try Ardell Individual Eyelash Extensions, available in flare, mega flare and also knot free. 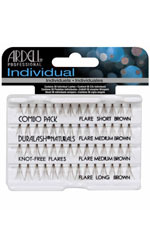 One Ardell Individual Lash pack contains 56 lashes and comes in black or brown, short, medium and long lengths. These lash extensions are permanently curled and waterproof to achieve long lasting glamour that can last for up to six weeks. Volume and length are effortlessly achieved with these comfortable and easy to apply lashes. Knot free, weightless, waterproof and easy to apply Short brown individuals. Can be worn for up to six weeks. This starter kit has everything you need to create your customised lash look. These Knot Free Lashes are perfect for providing a more natural subtle look. Super easy to apply and can be worn for up to six weeks. These combo lashes are perfect for starting out with individual eyelash application. These Flared Lashes are so natural you will forget they are not your own. Tailor volume and thickness with these Short Black individual false eyelashes. Knotted, weightless, waterproof, easy to apply and can be worn for up to six weeks. Tailor volume and thickness with these Long Black individual false eyelashes. Knot free, weightless, waterproof, easy to apply and can be worn for up to six weeks. Tailor volume and thickness with these Short Black individual false eyelashes. Knot free, weightless, waterproof, easy to apply and can be worn for up to six weeks. A combination pack of Knot Free brown individual lash clusters which are the closest thing to your natural lashes. Individual false eyelashes for a more natural look or to help fill in any gaps. Everything you need for false eyelash application with individual lashes, giving you the control over volume and definition. Perfect for lash wearers who want to customise their eyes, with thicker volume and a fuller, high definition eye. With 60% more lash strands than the regular Individual Lashes. Perfect product to create a customised look that you will love, these lash extensions create a high definition, effortless dramatised look. Uniquely designed to give a naturally volumised flare effect, with a naturally volumised flare effect. Create yourself some lucious subtle lashes, that last up to six weeks. These Flare Lashes are so natural you will forget they are not your own. Tailor volume and thickness with these Short Brown individual false eyelashes. Knotted, weightless, waterproof, easy to apply and can be worn for up to six weeks. Knot free, weightless, waterproof, easy to apply individual lashes. Tailored volume with these Medium Black individual false eyelashes.